That’s “Lucy” for asparagus. 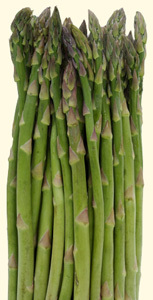 While visiting the Roba family in Pennsylvania recently, I had the most amazing asparagus! Cooked to order (twice) by Sue Roba in her cozy farmhouse kitchen. Wow! Was it ever good — and I deplored hot asparagus, until that moment of revelation in her kitchen. Cut fresh asparagus spears into (large) bite-sized pieces and dump them into a bowl. Shoot in a quick dollop of olive oil and stir them all around. Then dust liberally with freshly ground pepper, onion powder and garlic. Spread onto a cookie sheet and bake 5 minutes at 500-degrees. YUM!